The appeal was brought by a coalition of neighborhood groups who objected to what they perceived as the city’s abandonment of the traditional “neighborhood planning” approach in implementing upzones in one fell swoop (with few exceptions) across all of the city’s urban villages and urban centers. It’s important to understand the role of the EIS here, as required under the State Environmental Protection Act (SEPA). The EIS, which goes through a draft, then a public comment period, then a final issuance, is not the plan, nor is the plan “approved” if the EIS survives appeal. The EIS is a required public assessment of the probable significant adverse impacts of a proposed development plan, in order to inform both the public and policymakers of those impacts before the development plan is approved. An EIS must assess the preferred implementation, reasonable alternatives that accomplish the same goal (along with a “no action” alternative if none of the alternatives were implemented), and reasonable mitigation measures for limiting, preventing, or otherwise balancing out the adverse impacts. An EIS doesn’t evaluate the merits of a proposed action, or draw a conclusion as to whether it’s a good idea or not; it is simply a tool so that the public and policymakers can make informed decisions on those questions. As such, a final EIS can be appealed based on whether it adequately and accurately presents the required information, but it can’t be appealed on the grounds that one disagrees with the proposal. 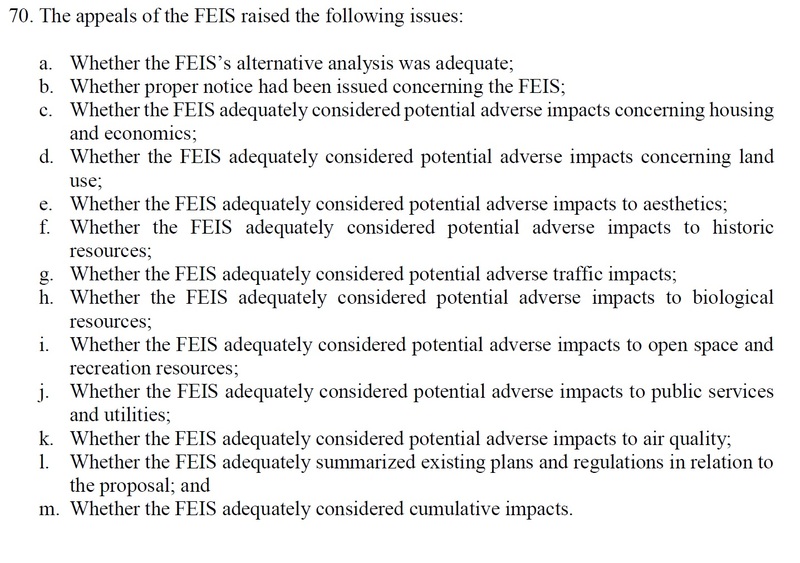 It’s perfectly legal in many cases for elected officials to adopt a development action that has significant adverse impacts; however, it may only do so after an FEIS is published that fairly presents those impacts, compares them to alternatives that accomplish the same goal that might have lesser or different impacts, and discusses potential mitigations. As applied to an EIS, the word “environment” is interpreted very broadly, and includes impacts no only to biological resources such as tree canopy and air quality, but also to housing and economics, aesthetics, traffic, public services, and several other topics. The coalition of neighborhood groups took an “everything but the kitchen sink” approach to filing their appeal, challenging the adequacy of thirteen different areas — plus some others that were dismissed early on in the appeal process. While the appellants certainly have a legal right to a complete, adequate and accurate FEIS, this appeal was never a serious attempt to stop the MHA legislation on legal grounds; it was rather an effort to mire it in a bureaucratic process that would drag it out for years, perhaps with the hope that the appeal would outlast the current set of elected officials and their successors might abandon it. There is nothing in the appeal process for an EIS that prevents further edits to address objections, and it’s only a question of how much time it takes to make enough edits to address all issues to the satisfaction of the Hearing Examiner. The government’s view is given substantial weight. When the proposal is not about a specific project (like this one), then the EIS doesn’t need to provide the same level of detail as to the impacts as it would otherwise. In order to be successful, an appeal not only needs to show that there is a flaw in the FEIS’s analysis, but it also needs to provide evidence of a significant adverse impact not considered in the FEIS. The only issue where the Hearing Examiner found the FEIS inadequate is in its analysis of the impact on historic resources. Mainly, this was an issue as to how the city sourced a list of historic resources (or potential ones) to present and analyze. According to the city, its own database of historic resources is not uniformly representative across the city, with some neighborhoods having far more complete information than others. During the appeal process, city representatives argued that rather than use that database and provide a potentially misleading view of the impacts to neighborhoods across the city, it chose instead to use data from the National Register of Historic Places (NRHP), a better-maintained database but one that contains much less information. The Hearing Examiner disagreed with that choice, finding that no evidence was presented that suggested the city’s own database had inaccurate information — it was just incomplete. As such, the city should have used information from both sources and provided appropriate caveats that the information presented was all the available information available though still incomplete. 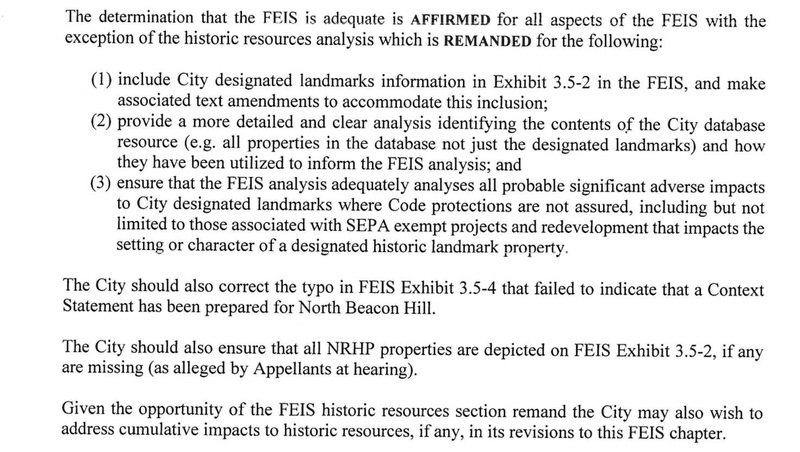 In his decision, the Hearing Examiner affirmed the adequacy of the FEIS for all parts except the historic resources analysis. For that part, he required the city to revise it to include information from the city’s database (with an explanation of how that information should be interpreted by readers), and update the impacts analysis accordingly. He also recommended a few other small corrections. This is almost the best-case scenario for the city, and the worst-case for the neighborhood groups that appealed. These corrections won’t take long for the city to do; in fact, in a press statement released on Wednesday shortly after the decision was published, Mayor Durkan committed that city staff would do the necessary work “in early 2019.” That would allow the City Council to finish off the MHA legislation, which has been on hold pending the appeal, as early as next summer. That will be particularly good news for Council member Rob Johnson, one of the primary architects of the MHA legislation; he has announced that he will not be running for re-election next year. Johnson will likely get to see his signature bill passed and signed into law before he leaves office. He issued his own press statement last Wednesday, praising the ruling and announcing that the Council’s committee on MHA will meet on Monday, December 3, to discuss the ruling and next steps. The appellants have until December 12 to decide whether to file a judicial appeal of the Hearing Examiner’s findings, which at this point is the only remaining potential roadblock for the MHA program.